Hi, I found this site via GW vermicomposting forum, as I was trying to gather info on the trench idea. (same reason as you stated, I have so much OM that bins would not be enough and I dont have storage to freeze it all). But here’s my question, if I set up the trench, will local worms come? Meaning that I may not actually buy red wigglers to put there. Is this a realistic option? I know I have pretty good soil around the property with some pretty big ole fat worms (once I was pulling up a big weed and in the soil was a worm so big I thought it was a baby snake!!) so I know they are there. Can I make this trench idea work with out adding worms initially? Thanks for writing in! I’ve been busy working on my new and improved trenches for this year’s growing season, and am hoping to start writing about them soon. Based on your situation (with loads of organic matter), I’d say you are definitely in a great position to take advantage of the vermicomposting trench idea. That being said, the ‘vermicomposting’ component is actually totally optional. 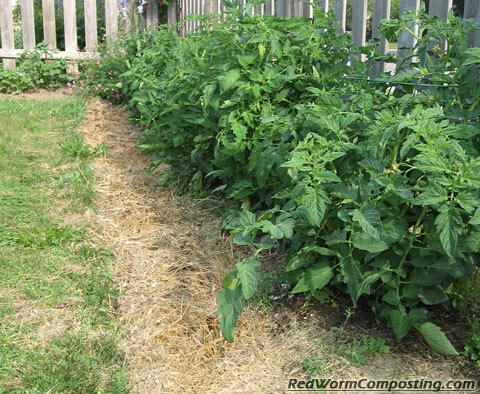 You can indeed simply set up these trenches for regular composting without worms. Soil worms will certainly be attracted into the trenches, but it won’t be like a normal vermi-trench, since the densities of worms will be much lower and they will still reside in the soil outside of the trench for the most part. The results with a normal composting trench might not be as impressive as with a full-fledged worm composting trench since the process of turning the wastes into compost will be a fair bit slower, but nevertheless, your plants should still really benefit from this. Good question – definitely very little in the way of care needed. If you are going away you might think about doing a ‘feeding’ before you leave, but that’s about it. It’s next to impossible to starve composting worms – far easier to over-feed them (in an indoor ‘bin’ type of system). If you left a trench to sit for an entire growing season without ANY further additions, you’d almost certainly still find composting worms in it – they may be smaller in size, but that’s about it. I don’t think the worms WANT to go anywhere else. When I got my first shipment from Bentley in late winter, the conditions inside my first bin probably weren’t to their liking; I had a lot of them climbing and clinging to the lids and many just hanging out along the top of the bins out of the mixture I made. (coconut coir, peat moss and shredded paper and cardboard. I thought they were all doomed, but after the moisture stabilized and anaerobic activity started getting more favorable (stuff rotting and good quality food for worms) they all stayed down in the mix. Now I have seven bins (like Bentley, I experiment to see what works) and not one worm WANTS to escape. I leave the lid off one but keep the bin in a pan of water to gauge losses (and keep ants out) Look at it this way; if you had everything you need in one place and didn’t need to go out, why would you? I’ll post new pictures of my latest shipment from Bentley on wormiculture.com. They are doing great in their new “worm condos”. I was wondering, if you would be so kind, what else is in your feedstock? I assume that “OM” is Organic Material, but what is “GW” vermicomposting? In bin four I use half rotted banana peels, unsalted peanut shells, apple cores; anything organic from lunch the guys at work save for me (I’m the worm dude now) for a couple other bins and in my newest bins I use straight scooped poop from a local farmer who raises sheep. She sells it in recycled sheep chow bags for $3.00. The worm population exploded so fast I added a bit of sheepoop to most of my bins. I do have some mites and Sphaerocerid flies in a couple of bins, but they aren’t a problem- yet. I’m headed toward one large system come fall, with a bin or two saved in the basement just in case. how about the moles,how do you keep them out of the trench? or your worm beds?????????????????? I was wondering if you scoop your castings out every once in a while and refill with food, or if your just grow a garden on top of or near the trench and then start a new worm trench in a new location the following year. So how does this work? Is it a one time deal? or are you feeding your trenches weekly/monthly etc? Thanks.